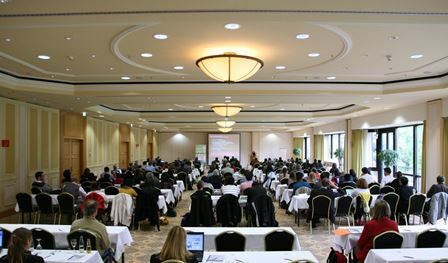 The CCRR-2013 conference, held in Dresden (Germany), brings together international experts to discuss the state-of-the art and future directions in regional responses to climate change impacts on natural, social and economic systems. The event includes contributions from national and international climate change and adaptation research as well as from practitioners and policy makers. Current research findings and local/regional experience and results will be presented. All abstracts and a selection of presentations are available for download. A Young Researchers Forum, held as part of the conference, focuses on "How to adapt to regional climate change? Perspectives from different disciplines." The forum will provide opportunity for young researchers to share and discuss their work. The Young Researchers Forum combines contributions from the following different disciplines: water sector, agriculture, economy, tourism, urban planning, transport infrastructure, health an practical experience. The majority of presentations are already available for download. Would you like to find out more about the topics and speaker of CCRR-2013? Please click through the abstracts. Please take a look into the updated programme. The Conference Dinner may take place at the Elbe river bank in the garden of Hotel Bellevue Dresden. Your booking for the Conference dinner is possible until May 13, 2013 (payment deadline). General information on oral presentations now available. Guidelinesfor creating a poster now available. Based on your preferences, we have compiled a programme structure. Please check the programme overview and update your registration by selecting the sessions. First Preliminary Programme Overview available. A more detailed programme will be provided soon. In addition to our sessions we offer four study tours. Take a look at the destinations. More than 170 Scientists and Practitioners from all continents have registered for our conference. Complete your registration as early Bird until March 15th 2013 and save registration fee. Please notice: speakers should be registered by March 15th 2013 in order to be finally accepted for the final programme. Abstract deadline closed. More than 120 abstracts had been sumbitted. Abstract Deadline extended until January 11, 2013.